We are conducting development of low-invasive diagnosis/treatment modalities for various cancerous diseases and various functional disorders. Suitable utilization of electromagnetic waves and/or mechanical waves will allow providing us the clinical modalities together with contributions to cellular engineering/measurement system engineering. Thus, we are working at transdisciplinary field. Sample 1: Breast scirrhous carcinoma tissue shear modulus images of a 48.0 mm x 44.6 mm ROI spreading from 17.1 to 65.1 mm in the axial direction. The reference material (thickness: 40.0 mm) covering the volunteer skin surface has a shear modulus of 1.2 x 106 N/m2. 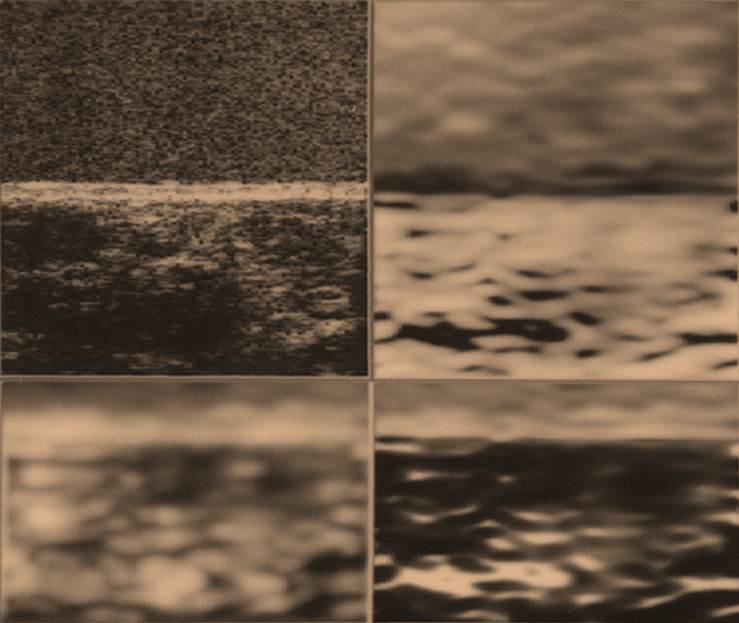 B-mode image under pre-compression (upper left), and reconstructed absolute shear modulus images in the log gray scale (upper right, Inverse shear moduli; lower left, shear moduli; lower right, shear moduli with a high resolution). The highest value: 2.35 x 107N/m2. Upper right (DR: 65.4 dB, lowest value: 1.26 x 104 N/m2, bright region relatively low shear modulus value. ), lower left and lower right (DR: 54.9 dB, lowest value 4.21 x 104 N/m2, bright region high shear modulus.). 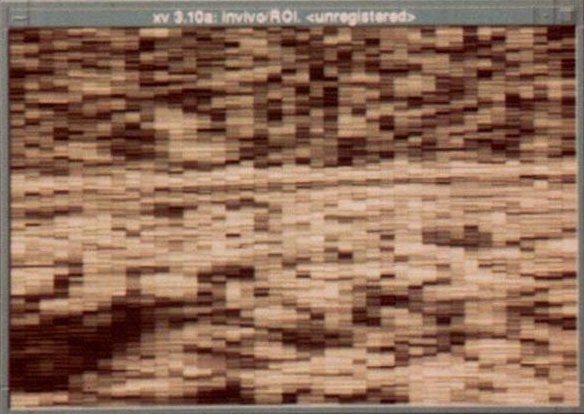 Strain image in a log gray scale with a dynamic range of 14.4 dB,in which the bright region indicates that the region is relatively soft and vice versa. As shown in this image, the multiple-layer structure of fat and muscle is favorably visible. Conventional B-mode image (Ｎominal frequency: 3.5 MHz). Sample 2: Images obtained on the fresh in vitro pork rib (ROI size: 20.0 mm x 72.8 mm). Strain image in a log gray scale with a dynamic range of 11.1 dB. The reference material attached on her skin surface has a shear modulus of　2.8 x 105 N/m2, and this image exhibits the spatial variation of shear modulus from　4.1 x 104　N/m2　to　5.2 x 105 N/m2. 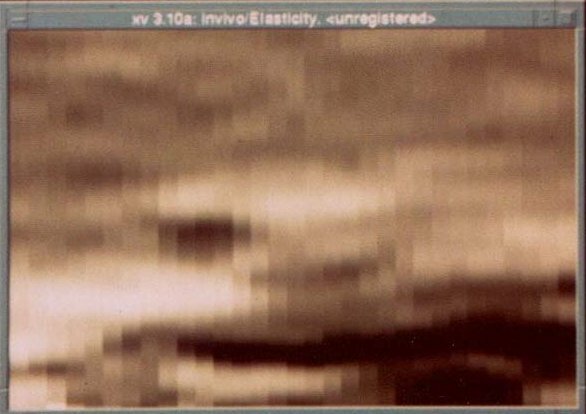 Also in this elasticity image, the fat seems to be favorably visible (lower left area). Namely, it should be rather soft. However, interestingly in this image, the mammary glands being stiffer seems to be visualized below the skin surface and also at the lower right area though it's difficult to detect them from the conventional B-mode image. B-mode image (Ｎominal frequency: 3.5 MHz). Sample 3: Images obtained on the in vivo breast tissue (healthy 37-years-old, ROI size: 19.9 mm x 30.0 mm).